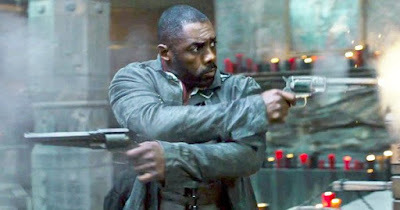 We're just weeks away from seeing the long-awaited adaptation/sequel of/to Stephen King's epic series The Dark Tower. Hope that made sense to y'all. Much fuss has been made about how little publicity there's been for the flick, with Sony only releasing a trailer, a few posters, and some TV spots. I find this approach a breath of fresh air, as back when I was a boy, movies got a trailer three months from release, a poster or two, and some TV and radio commercials. That's it. Ahhh, the good-old days. When we weren't spoon fed everything about a movie before it came out! Suffice to say, I'm happy with the amount of publicity The Dark Tower has received so far. Surprise: it actually makes me want to see it more! I still like what I see, and am just as pumped, if not more so, for The Dark Tower's Aug. 4 release. How about you, Basementites? PS: There's also only been one trailer for that other Stephen King adaptation, It, and It comes out in two months, for the record. Yes, I want to see It as well. See what I did there? Good.